Conagra Brands is recalling more than 135,000 pounds of Salisbury steak products that may be contaminated with extraneous bones. The U.S. Department of Agriculture’s Food Safety and Inspection Service says the product being recalled is the 27-oz. 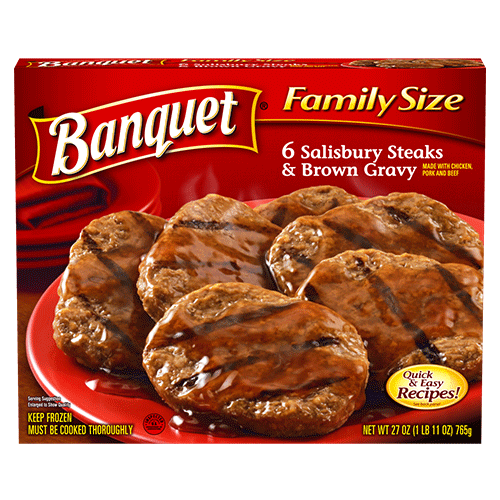 carton containing six pieces of plastic shrink-wrapped packages of “Banquet family size Salisbury Steaks & Brown Gravy made with chicken, pork and beef - grill marks added." The products have a lot code of 5006 8069 10 05 and a ‘best by’ date of September 1, 2019 printed on the package. The FSIS says the packages were shipped to retail locations nationwide. The problem was discovered after the firm received several consumer complaints and three reports of minor oral injury associated with eating the meals. The FSIS warns consumers to not the meals, but to instead throw them away or return them to where they were purchased. Koch Foods also is recalling nearly 120,000 pounds of beef rib-shaped patty products that may be contaminated with extraneous materials, specifically thin blue plastic pieces. The FSIS says the 30-pound bulk boxes of fully cooked, not shelf stable, rib-shaped beef patty with barbeque sauce products were produced on July 8, 2016 and are identified by case code “67329” and lot number “JTM 16190” on the label. These items were shipped to distributors nationwide for institutional use. The problem was discovered when a customer notified the Koch Foods. There have been no confirmed reports of adverse reactions due to eating these products.